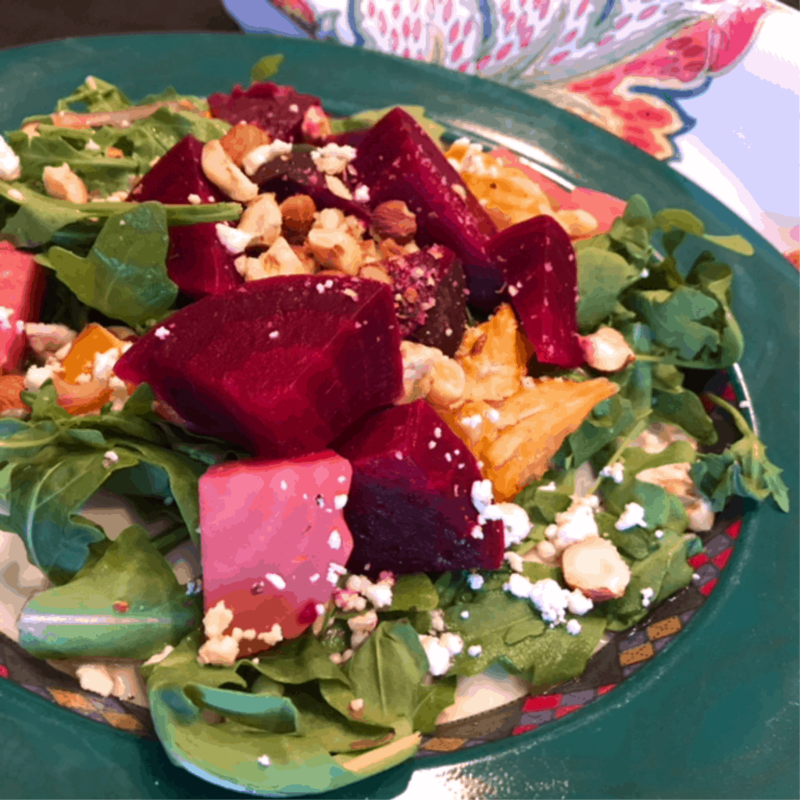 Before you say, “I don’t like beets” try this Roasted Organic Beet Salad. It will totally change your opinion of beets because of the roasting process combined with the addition of citrus and herbs. Your taste buds will explode with the flavor/texture combination of sweet, tangy, savory, crunchy and spicy! This fabulous salad has it all and is perfect year-round. What Type of Beets Should I Use in Roasted Beet Salad? Genetically Modified Organisms (GMO’s), also known as “bio-engineered” foods are quite controversial. Beets, also known as sugar beets, have gotten a bad rap in the past due to the fact that most of us tried them as kids and hated them and, in U.S. crops are one of the most genetically modified. There’s a plethora of information, legislation and argument for the Pro’s and Con’s of GMO’s. In light of this, this author recommends certified organic beets. Beets are believed to offer some healthy benefits including lowering the risk of cardiovascular disease and acting as an anti-inflammatory, and while most of these studies have not been definitively proven, some beet facts are true: Beets offer a big dose of Vitamin C and fiber; other nutrients include iron, Vitamin B6 and magnesium. Beets are inherently low in fat, cholesterol and calories. Outside of the spicy arugula, sweet beets, crunchy roasted hazelnuts and creamy feta, the sweet and tangy salad dressing is what sets this salad apart from others. It’s a mild combination White Raspberry Balsamic Vinegar, malt vinegar (or red wine vinegar), sugar and a pinch of salt. If your grocer doesn’t carry White Raspberry Balsamic Vinegar, feel free to contact The Grapevine Olive Oil Company and they can send you some! They carry a wide array of imported and domestic oils and vinegars infused with raspberry, chocolate, garlic–you name it! You'll rethink beets once you have a bite of this sweet and tangy beet salad! Say you hate beets??? Not after you try this delicious version!